And could Mario end up on Xbox? Phil Spencer, head of Microsoft's Xbox division, has some grand visions for the future of both its upcoming hardware and the possibility of future crossovers. 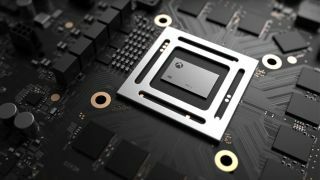 The executive would love to see Project Scorpio - the upcoming, upgraded iteration on the Xbox One - keep a console-appropriate price point, as well as one day have Nintendo's famous platforming plumber, Mario, on Xbox, Spencer tells AusGamers. While discussing the logistics of the souped-up architecture present in Project Scorpio, Spencer remarks that the console strives for "balance" - particularly the kind that allows the machine to handle true 4K and VR gaming without commanding prices more commonly attached to similarly capable PC rigs. Regarding the desire to feature Mario on Xbox hardware, Spencer chalks the possibility up to wishful thinking. “As someone who’s been in this industry and played games forever, I’ll still say it: Nintendo has the strongest first-party of anybody,” Spencer explained. “They’re just fantastic and the memories that they have instilled in so many of us, who’ve played their games and had those delightful experiences ... having those on Xbox would be great." Though a pipe dream, to say the least, the Xbox exec points out that the Microsoft-owned Minecraft did make it to Nintendo's Wii U console, along with an exclusive Mario-themed coat of paint to match. Additionally, Nintendo's recent decision to branch into mobile games, including the debut of Mario on iOS next week with Super Mario Run, makes the odds of future mashups slim - but not a total impossibility.